ASCE President Kristina Swallow speaks at the Atlantic’s Summit on Infrastructure and Transportation in Washington, DC. Nearly one year into Donald Trump’s presidency, his campaign promises touting infrastructure investment remain unfulfilled. 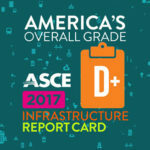 And so, two months into Kristina Swallow’s ASCE presidency, she is taking the case for infrastructure directly to the nation’s capital. 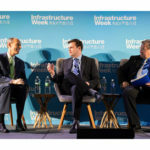 Swallow was in Washington, DC, last week for three days of infrastructure advocacy work, pushing to turn Trump’s lingering language into legislation. 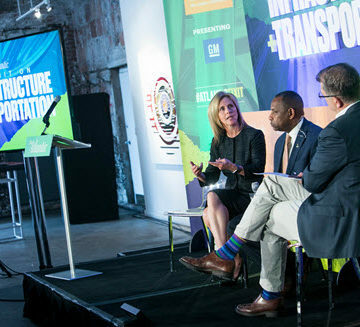 Swallow participated in a panel discussion, Wednesday, Dec. 6 at the Summit on Infrastructure and Transportation, hosted by The Atlantic, putting her infrastructure message in front of some of the industry’s biggest movers and shakers. 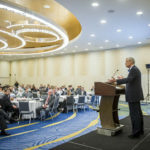 ASCE Board of Direction member Roger Millar, the Washington State secretary of transportation, also spoke at the Summit. Swallow spent three years in Washington earlier in her career, working as a legislative assistant doing transportation policy work for Sen. Tom Udall (D-NM). So she knows this world. And she knows how to effectively communicate the infrastructure message. Wednesday, Swallow visited the White House Eisenhower Executive Office Building to meet with DJ Gribbin, President Trump’s special assistant for infrastructure. With the administration planning to roll out an infrastructure plan in January, it was a particularly well-timed meeting. Swallow turned her attention, the next day, from the executive to the legislative branch, meeting with four members of Congress – two Democrats and two Republicans. “Having worked here in DC for three years, I really truly understand how important advocacy is,” Swallow said. “Our elected leaders want to do what’s right by their communities. But they rely on us to tell them what’s important and what the priorities are. 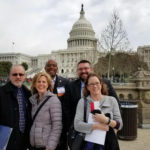 Learn how you can reinforce Swallow’s advocacy efforts as an ASCE Key Contact. I am very happy to see President Swallow’s activities in Washington with regard to infrastructure. We need action with regard to this initiative! There is nothing better to put people to work and improve the economy than infrastructure improvement and new construction. Congratulatons President Swallow for taking this initiative to meet with various members of congress and representatives of the Trump Administration.